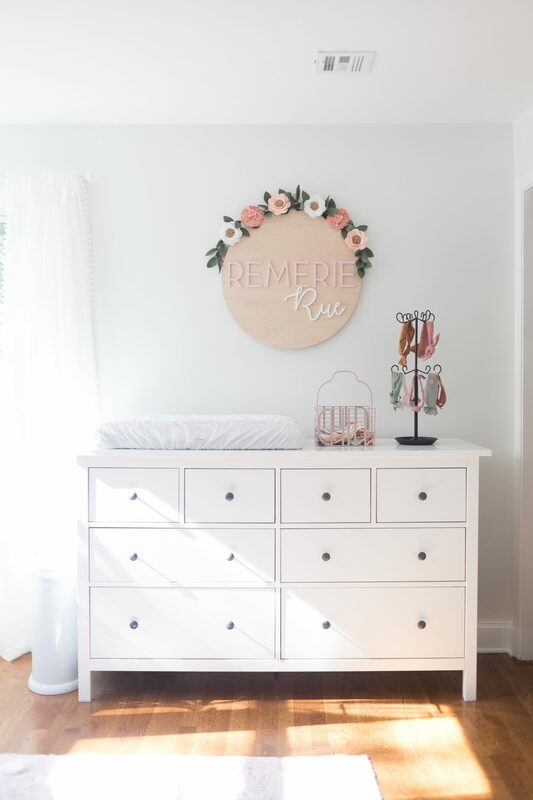 We finally have entirely finished one room in our new home, sweet Remie Rue’s nursery!!! 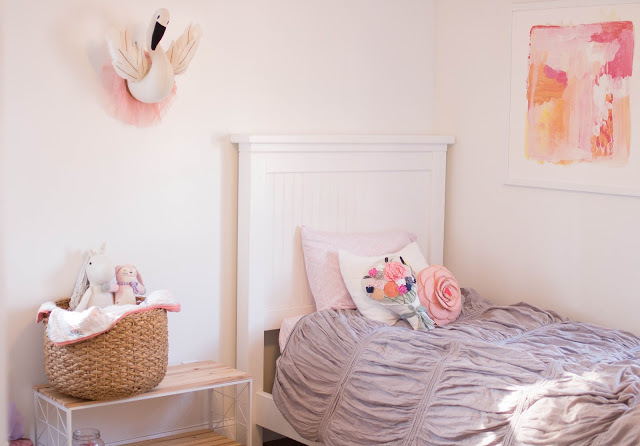 This space was so much fun to decorate and probably the easiest of all the rooms for me to put together, kids rooms are just the best and always end up being my favorite of all. 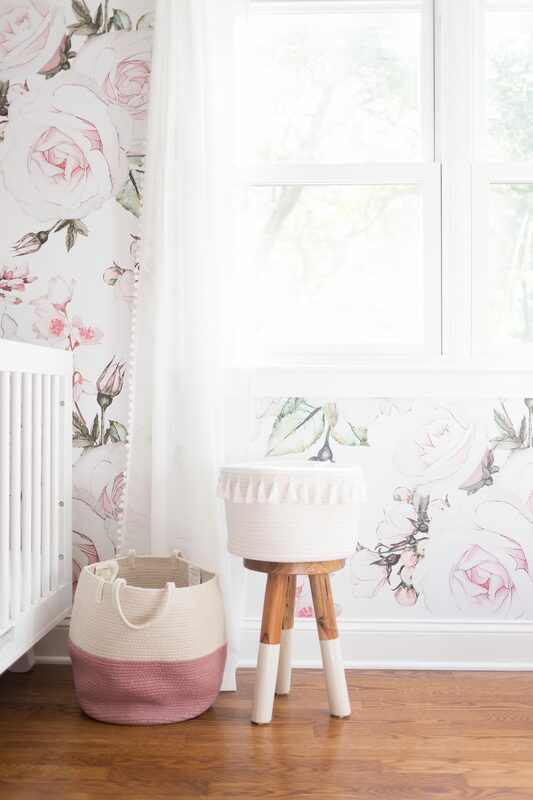 My inspiration for the entire room came from this wallpaper from Shop B Darling. 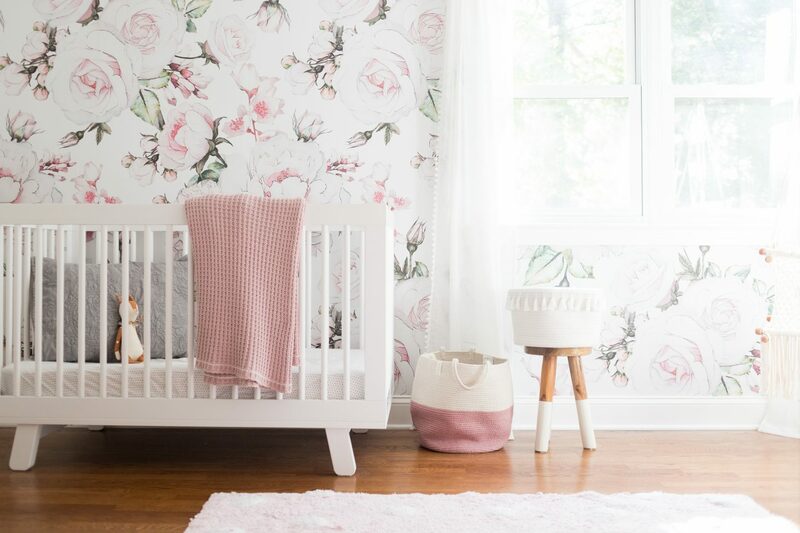 With it being our third baby girl, I decided to completely embrace all things feminine and sweet — and the wallpaper just did that for me! 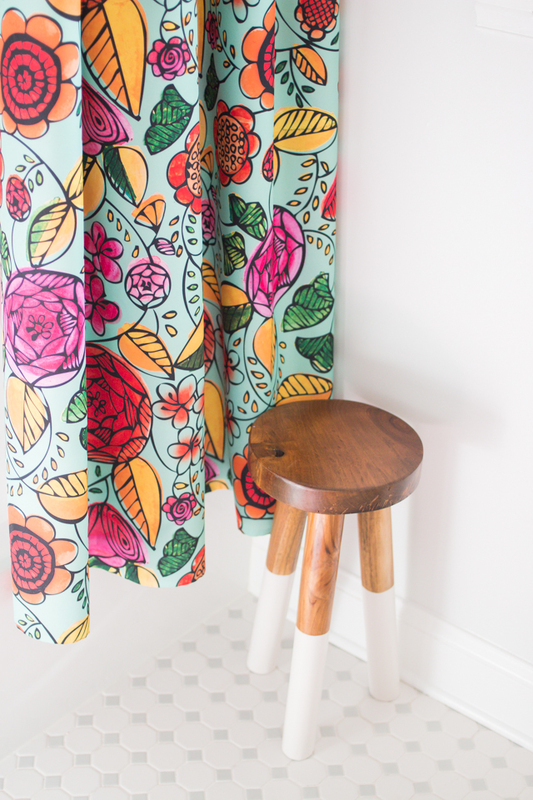 I had been wanting to try wallpaper forever and loved it just as much as I thought I would, it was super easy to put up and transformed the entire room in one afternoon. I am already thinking of the next place I want to put some up! Since the print was pretty large & busy, I wanted to keep everything else light and basic. We bought another of the Ikea dressers that we already have two of (they are seriously the best ever and so affordable! ), and got a new crib that will convert to a twin bed when she is older. 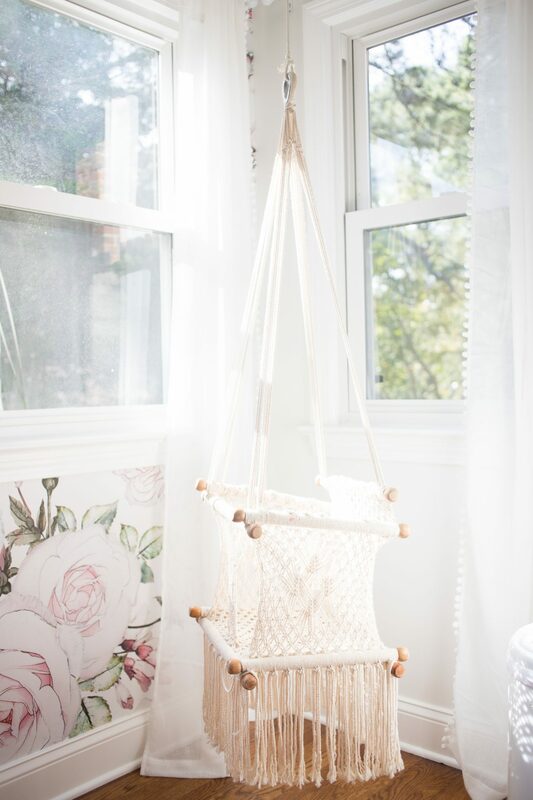 I also had been hoarding the prettiest swing forever and just could not find a place to put it, and loved how it looked in this space! The very last piece was added was her name sign, while most everything was finished before she arrived, I left a space for it since I knew I wanted to have one there but we didn’t know what her name would be. 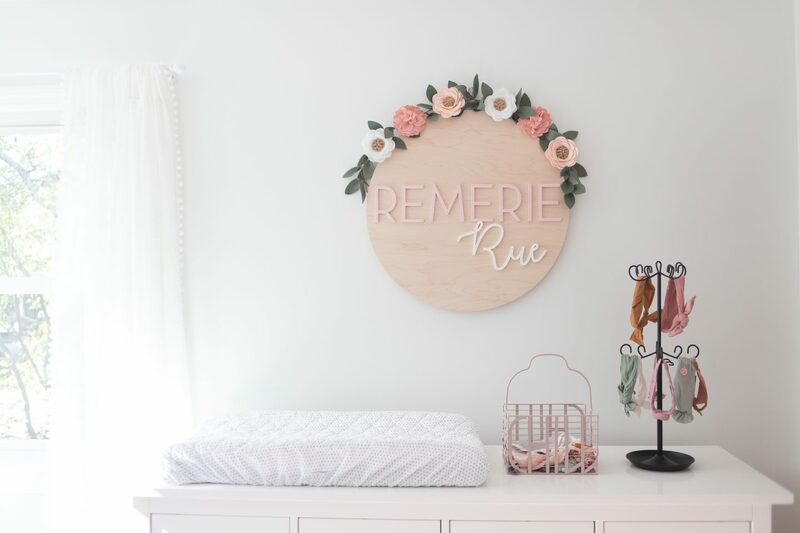 When it came in the mail last week it was so perfect and just the final touch to make the sweetest nursery for our Remie girl, I hope she grows to love her little space as much as we do! *Bow holder & basket on the dresser are from TJMaxx. A long overdue house update, it’s now been about four months since we closed on our second home at the end of April and a little less than three since we officially moved in! I completely meant to share more about the process, but it turns out life with two kids, one on the way & a house renovation is crazy — and also, even though we have gotten SO MUCH done, we don’t really have a room that is 100% done yet, and I want to wait to share until then. Hopefully room by room, as we finish them! The hardest part of this entire experience was the time between closing on our old house and our new house being “livable” enough to move in. 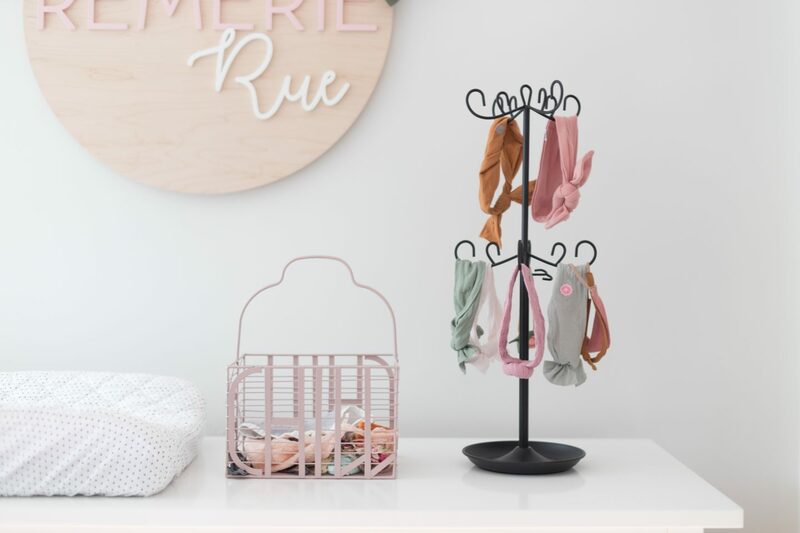 During those weeks the four of us weren’t living together (which was really hard mentally, for the girls & us), and it felt like every time we turned around there was another setback that we didn’t plan for time or budget wise. 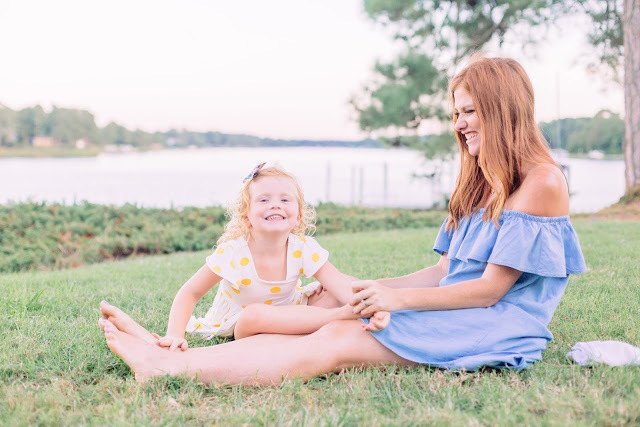 It was HARD, and didn’t help that I was pregnant and desperately trying to keep the girls on a schedule, since they were both still in school. But we managed, got it done and were able to move in — the house still needed so much work but being together, under the same roof again, was so much of a relief that it made things like not having a sink or oven seem like less of a big deal. I will never forget those first few days we finally moved in, having the girls sleeping in their own beds again and pulling out our own dish towels and bowls was soooooo exciting! 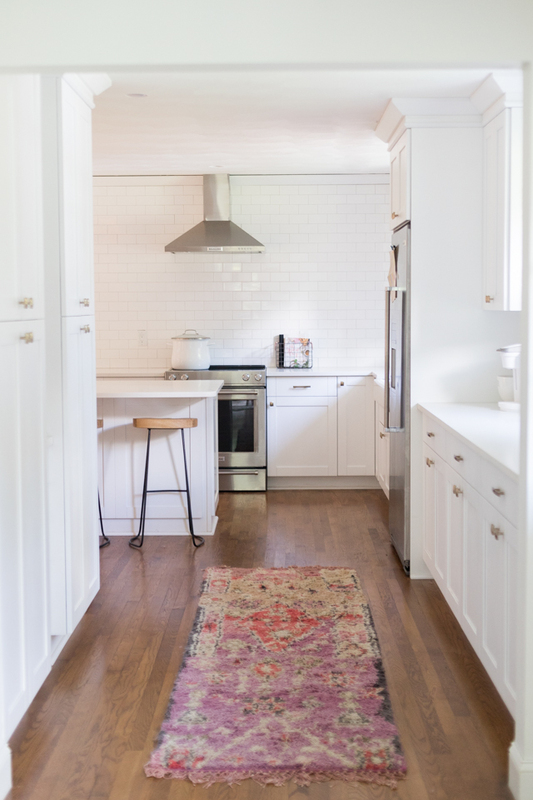 Since moving in, we have just done little by little, I have found it so important to count small victories each day and to just take one project at a time. I am so Type-A and hate unfinished anything (or a mess! ), so I really have to remind myself all the time that it will all be worth it. Which it is already. My husband has done a lot of the work himself and it really is so amazing to see our vision come to life, especially when it’s him creating it. 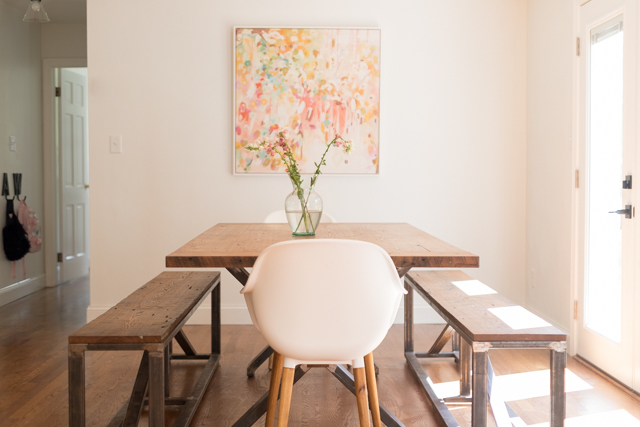 There is something to be said about a house that you make your own, making decisions on paint colors or knobs can be really overwhelming but I love that everything is personal to us. A few photos of parts of our downstairs, including a little peak into the kitchen, by far our biggest project so far! 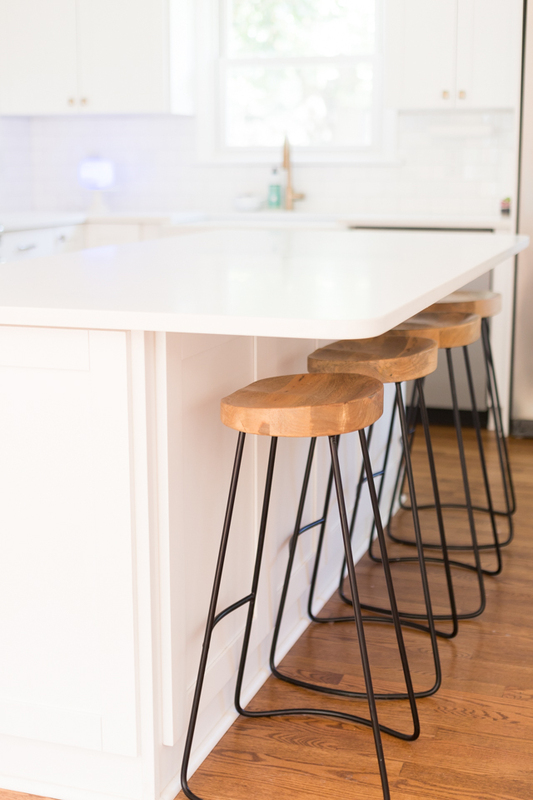 When we moved in, the kitchen was dark and really small, we knocked down a wall and part of another to make it bigger, as well as gutted pretty much everything in it — I cannot believe what a change it is! We are waiting on some wood floating shelves for the main tile wall and then it will be complete, just in time for all the fall decor! 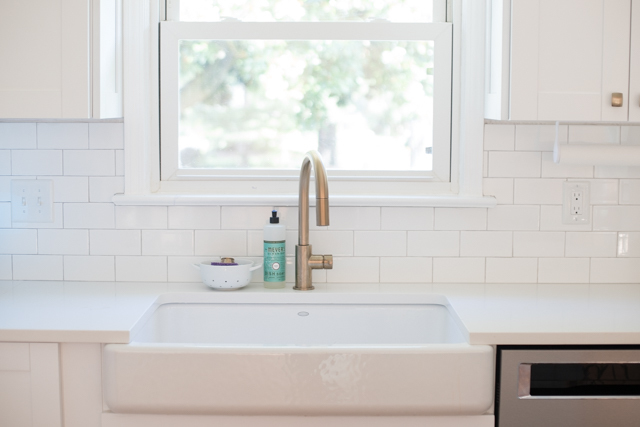 We started the girls bathroom makeover back in June, and it is still not entirely complete, so let me preface this post by saying that this is indeed one of the longest house projects of all time. We are forever battling the time issue (like there is never enough of it), with two full-time jobs and two kids, we are BUSY. But I always try to remind myself that there will come a day when our babies aren’t babies anymore, and they won’t want to hang out with us, and then we will be sad and have all the time in the world. So for now, we will embrace and love the crazy (and the constant to-do’s that come with it!). When we moved into our house four years ago, the hallway bathroom was a hot mess, a pretty horrible 80’s style avocado green and a vanity that was not in the best condition. But we had so much we wanted to do in other places of the house, so we pretty much put that project on the back-burner since it was still in working condition. Fast forward to the end of last spring, we gutted it and started from scratch! We are not planning on this being our forever home (mostly because we want to be in a more rural area of VB), so we did the updates pretty classic and mainstream to make it more marketable. 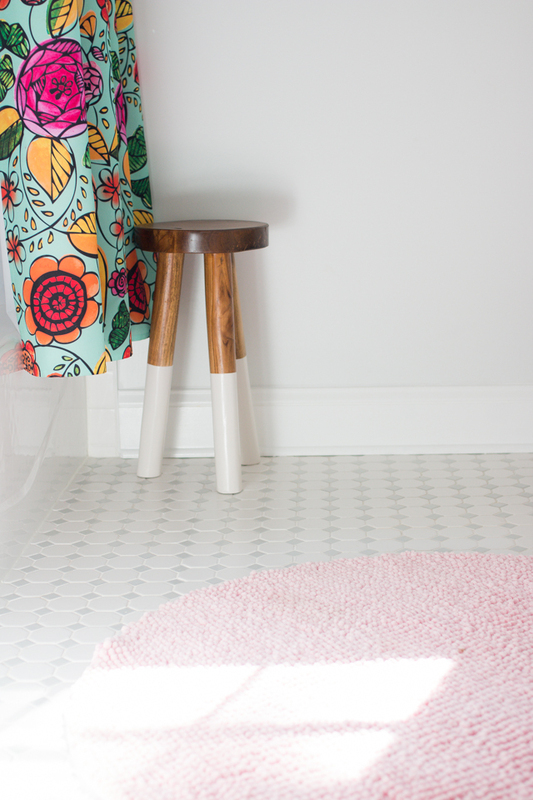 We went with a grey & white ceramic tile for the floors, a white subway tile for the wall by the bath tub, and painted the walls white with white trim. I have this thing with white. 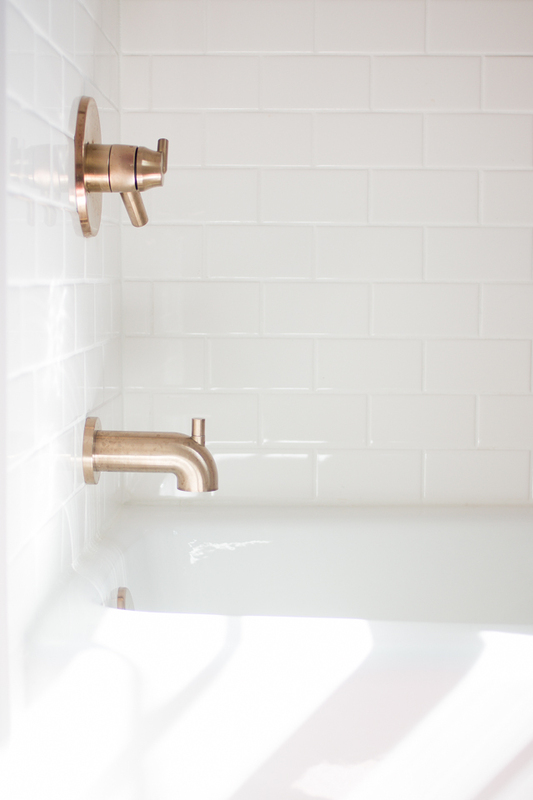 I really wanted pops of gold (although I’m not sure how smart that is for selling, I just couldn’t resist), and we found some pretty affordable gold fixtures on Amazon. 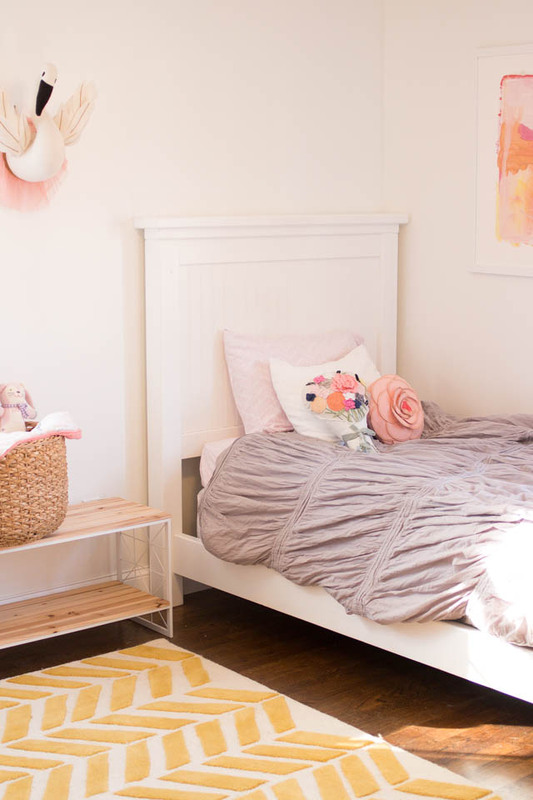 Everything we have purchased up to this point is linked at the bottom of the post, I love how it just feels so clean and bright, with pops of color added in by the accessories! My husband is currently building the vanity (we went with grey!) and I can’t wait to share that, along with the lights and mirror we pick to go with it, after it is all complete. For now, I am just happy that we have a place to give the girls a bath in again, I still cannot believe we made it through an entire summer with a two & five year old, and no working bath tub in the house! Lastly, I wanted to share the sweetest line of spa products for little girls. Poshy Girls recently sent us over the cutest spa kit, and the girls love it, mini facials sand pink glitter soap!!!! 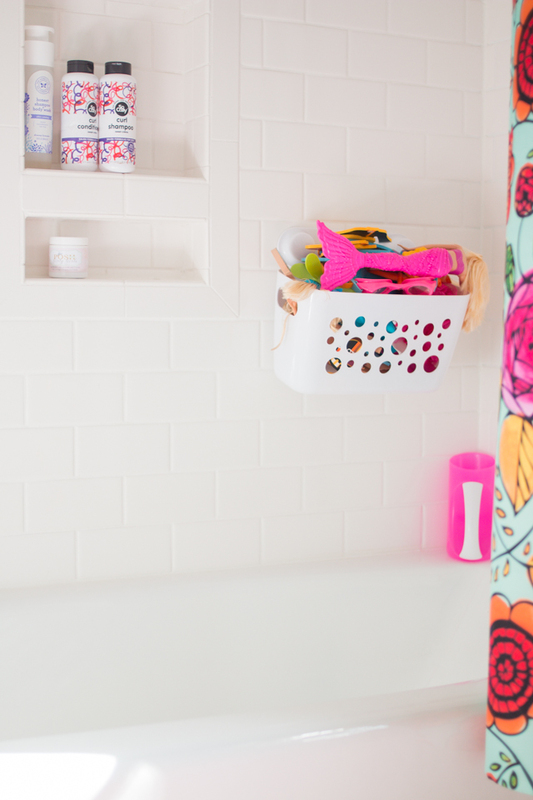 The mini facial tub is pictured above in the last photo from the girls bathroom, it’s a favorite at our house. 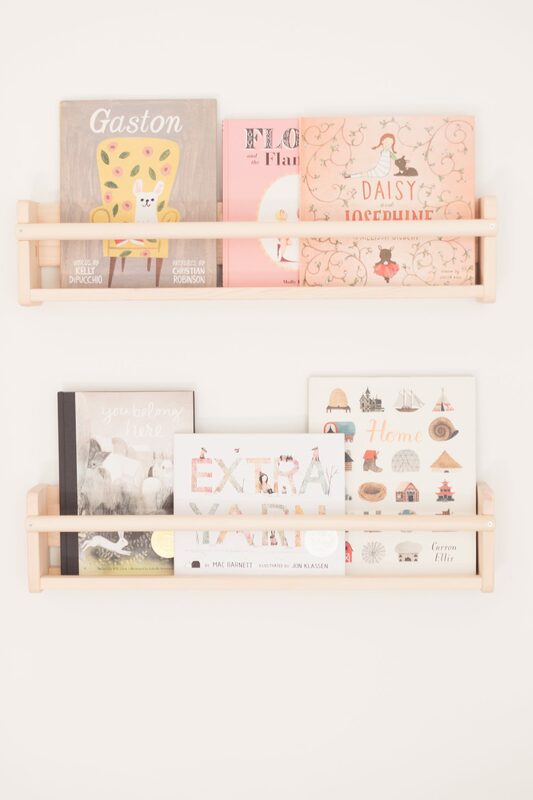 You guys must check them out, such fun products for little girls! Happy week ahead, friends! We have been really busy with house projects over here since the new year started, and I am super excited to share some of them in the next few weeks!! One of our resolutions for 2017 was to really focus on some of the one million updates we have had on our to-do list forever, although I am certain that we will always keep a list, because that’s just the way we roll. 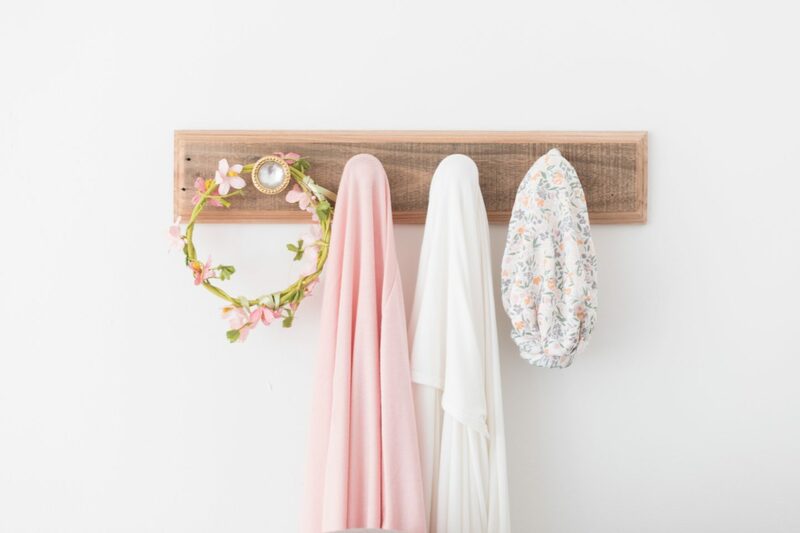 I seem to always find something new I want to do to refresh our home and change things up a bit, a quality of mine that my sweet husband may just want to change about me. We painted the walls white and replaced all the baseboard, which is actually a project we are working on through out the house. Our house is old (one of things that I actually love about it), so it’s amazing what a huge change that has made! 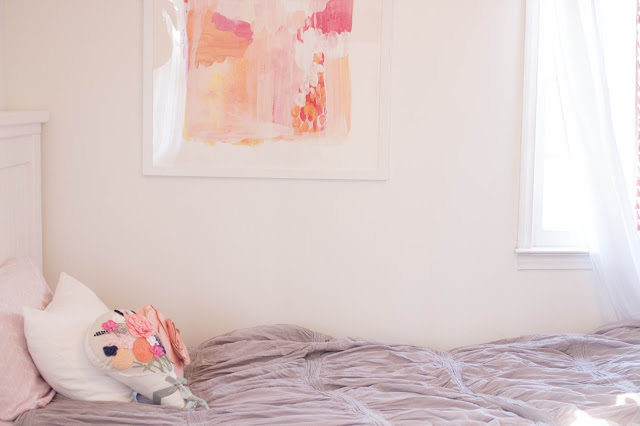 Her room already had some pops of pink and gold, which I kept, but then also added some yellows, which were inspired by this beautiful painting that I teamed up with Minted on. Love it so much!!! 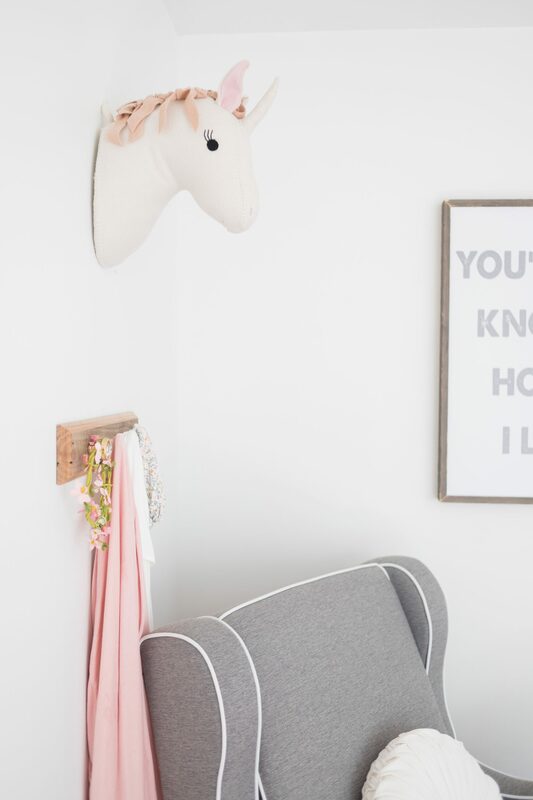 Other details are linked on the bottom of this post, including this rug from Land of the Nod, it is even better in person! I have been really hesitant to write this post. Partly because I had some struggles with it, partly because I just haven’t had the time to really sit down and think it through, and partly because I just really wasn’t sure how much I wanted to share. But it just didn’t feel right not being 100% honest about all of my life. 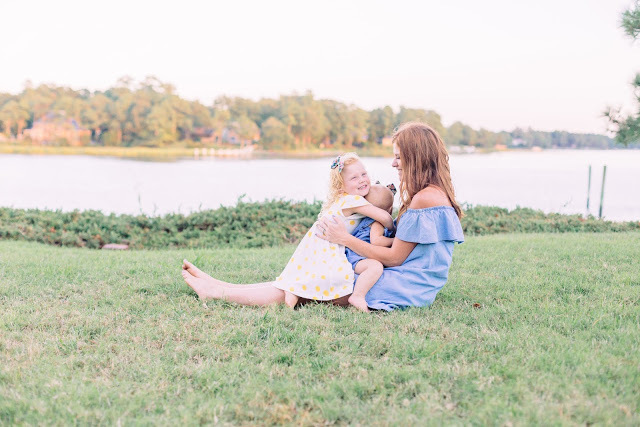 This blog is about our family and my journey through motherhood, the wonderful, crazy roller coaster that all of that is, and this is just another stage of it. If you have been following us for a while, you know that I was a fashion marketing teacher at a high school for eleven years. After having Avalon I went part-time, and then at the beginning of 2016, I resigned completely to accept a position as a part-time bridal stylist and pursue my own wedding planning business. So starting last January, I would work about three days a week at the bridal salon, usually afternoons/evenings, and pretty much every single weekend. The other days I stayed home with my girls, while somehow trying to figure out how to be a business owner for the first time in my life. To market & promote myself, to keep myself organized with the clients I already had, and to attend meetings to coordinate the weddings I was planning. Plus of course, the weddings. I also was trying to continue to manage this blog, which has always been such a great outlet for me. 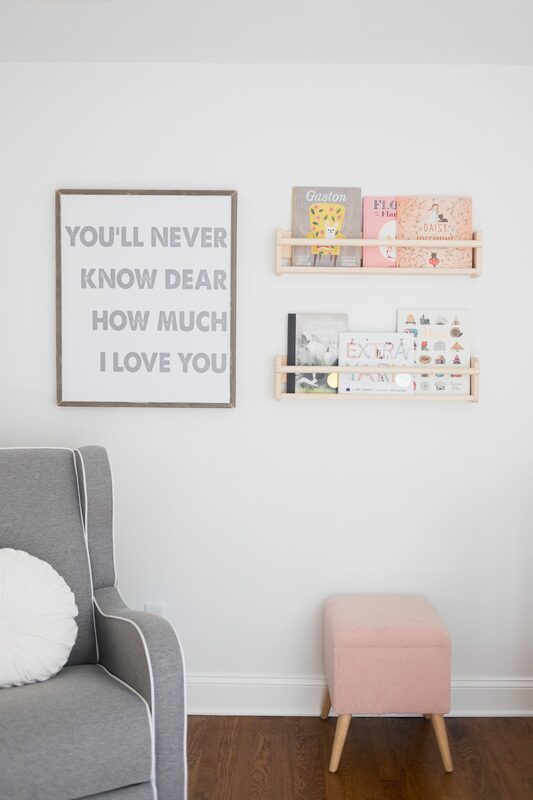 A place that I feel so grateful to have for my kids to look back on one day, where I have made so many great relationships with inspiring ladies and fellow mamas, and also, a place that has turned into a side-business for me (which we really needed when I was no longer working full-time). I am sure there are tons of people out there that manage all of this (and more), but it didn’t take long before everything started piling up & I was left feeling pretty overwhelmed. Above anything else, the biggest reason that I decided to make the change was to give me more time with my girls and even though I was physically there with them more than before, there is no doubt that I was getting way less quality time with them than I ever had. I was stressed, I was trying to fit the biggest to-do list ever into an hour naptime, and when that didn’t happen, I felt anxious the rest of the day while I was trying to accomplish things when they were awake. They needed me, all of me, and though I did everything I could to make it work, most days I was stressed and overworked, and trying to manage way more than I could handle. Ultimately, I found that all of the things I thought I would love about this new schedule were exactly the things that I found the most challenging. And with that, the things that I thought I didn’t like about teaching were exactly the things that I so badly wanted back. I missed having a set Monday-Friday schedule. The benefit of always knowing when I was going to work (and that I would always have holidays and summers off!) was something I completely took for granted for so long. I also really hated working nights, I thought I would rather have the mornings with my girls, but after this experience, I would take getting work out of the way in the morning and then getting to spend each afternoon & night with them ten times over that any day. I always thought I would love working from home, especially after I became a mom. I don’t know that my personality lends itself to not working at all (though we could probably make it work without my income, we definitely wouldn’t be able to give our kids what we want to, to be able to have the freedom to accomplish all we want to, or to grow our family), so before all of this, I truly felt like a job from home was the best of both worlds. That was definitely not the case for us. I now have the UPMOST respect for moms who run a business while taking care of their kids, to put it simply, my high-maintenance little divas (love them so much!) need my full attention and I want to give it to them. We all did better when I could just be with them I was home and then get my work done at a job outside of the house. And lastly, working weekends was really hard on me and even harder on the four of us. Spending time as a family is what we value most, and with my husband gone all week at work and then me gone on the weekends, our times together were few and far between. SO! Very long story short, after getting down on myself for a couple months for messing up a really good thing that we had, I decided one day out of nowhere to look into going back into teaching, but in a different field. 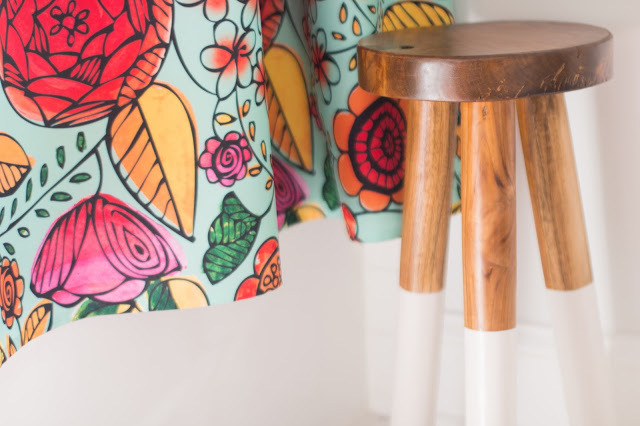 While I loved teaching fashion when I was younger, as time progressed, I really felt like I needed a change, something that would give me a new challenge and motivation but that would still leave me in education, because I really did love it. 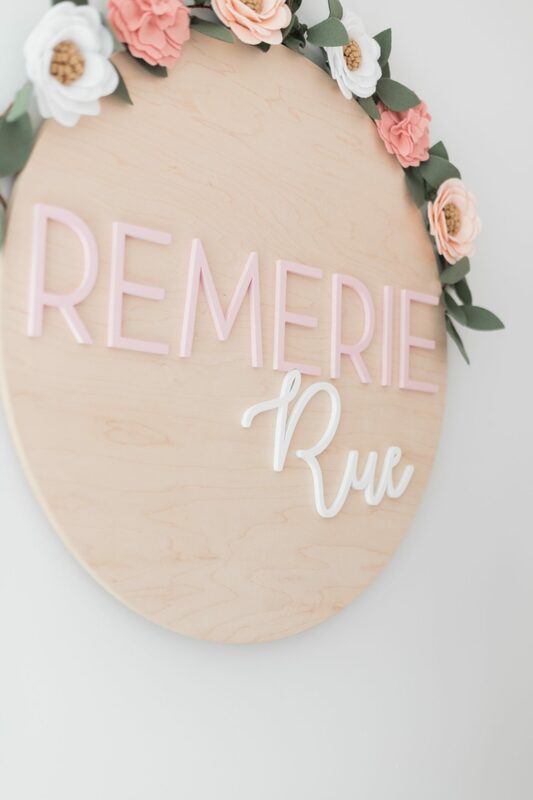 I took a class to get certified to teach something different (while still working at the bridal salon, planning weddings, and blogging to make money! ), and somehow, all the stars aligned and I got hired at an elementary school eight minutes from my house teaching early childhood education, PRESCHOOL! Which was crazy, since that’s exactly what I hoped for when I decided to take the class this summer. 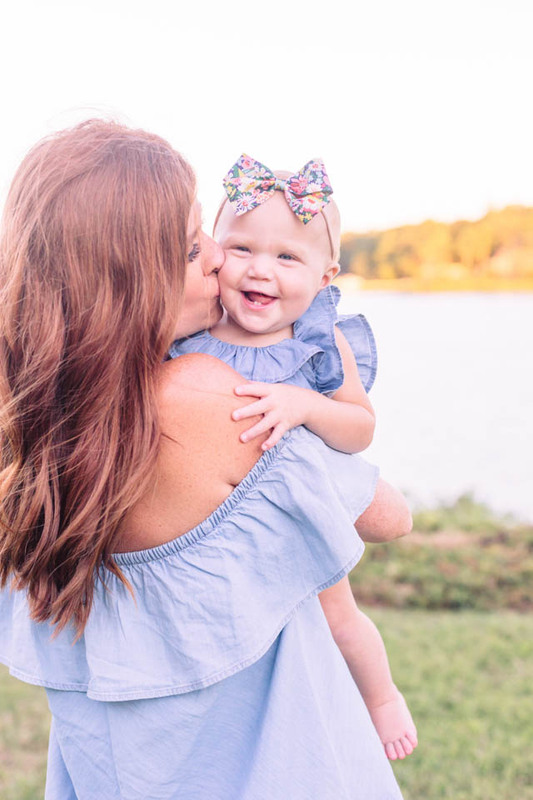 I will always be supportive of ALL my fellow mamas, whether you have a full-time or part-time job outside the house, are running a business at home, running a household staying at home with your little ones, or at a crossroads trying to figure it all out. Every situation is different. We all have our challenges and triumphs, we are all just trying to make the best life for our babes, the best way we know how. I’m forever thankful for mine. I just couldn’t love them one bit more, they are the light of our crazy life!